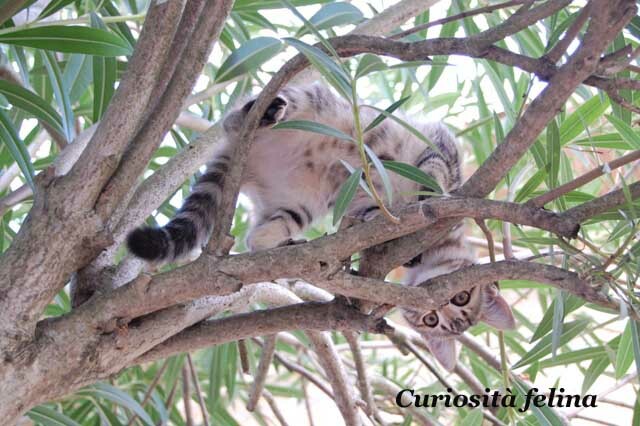 The origins of CITTA’ DELLA PIEVE are still unknown. Documents dated back to 1000 call it Castrum Plebis S. Gervasi. 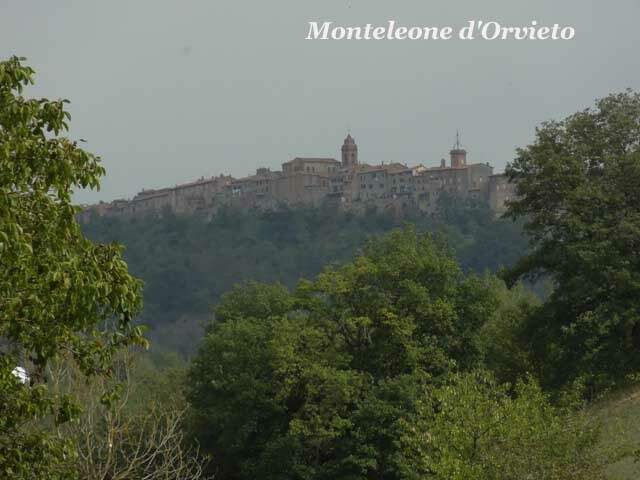 From the 14th c. to the 17th the name was shortened into Castrum Plebis and in 1600 circa Pope Clement VIII rises the town to the dignity of city by calling it Castel della Pieve. 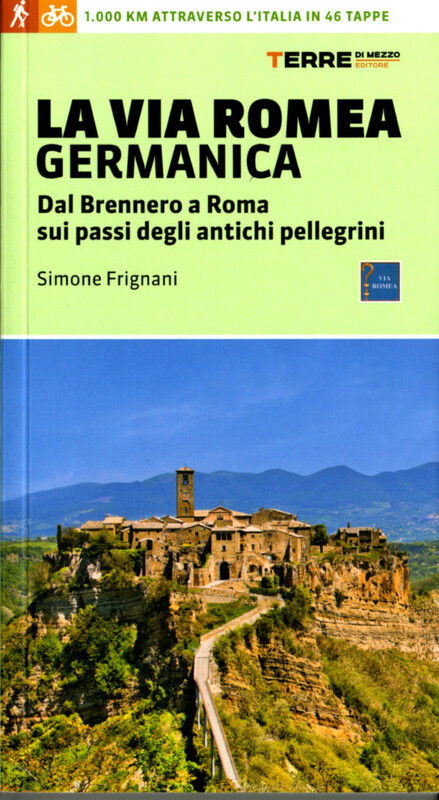 The hill where the city is was settled in the most remote times: many archaeological remains found in the nearby countryside, such as tombs with funerary urns in alabaster prove the antiquity of the town, which is set in a landscape of extraordinary beauty, between Val di Chiana and Lake Trasimeno. Città della Pieve shines the most among the other towns of Umbria for its buildings almost entirely made of red bricks, rather than limestone blocks. Seen from outside, its compact precinct walls stand out with the intense redness of the brickwork, produced locally already from the 13th century. 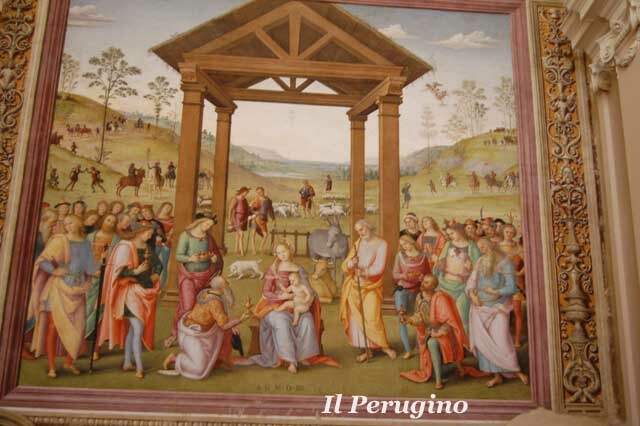 within the walls, the grace and elegance of the buildings is enriched by the frescoes by the celebrated Renaissance painter Pietro Vannucci, known as Perugino, born in Città della Pieve. The celebrated artist, was the tutor of Raphael, left in his home town many of his works such as the spectacular Adoration of the Magi. The Palace of the Corgna family is of great interest along with its wall paintings of the middle of the 16th century, and the beautiful Cathedral. 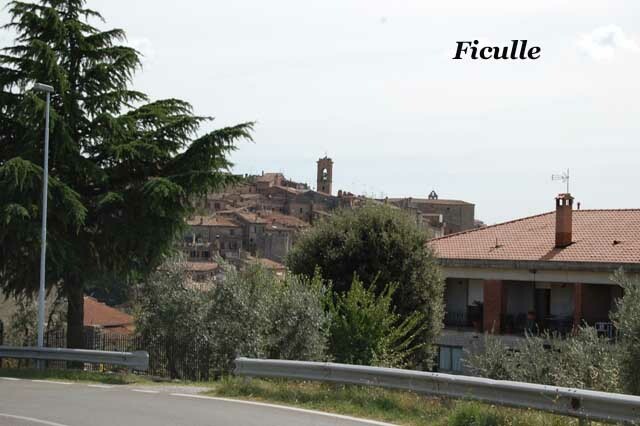 SALCI – The earliest records of this beautiful village go back to 1243, the year in which Frederic II chose for establishing the borders of the possessions of Castel della Pieve. 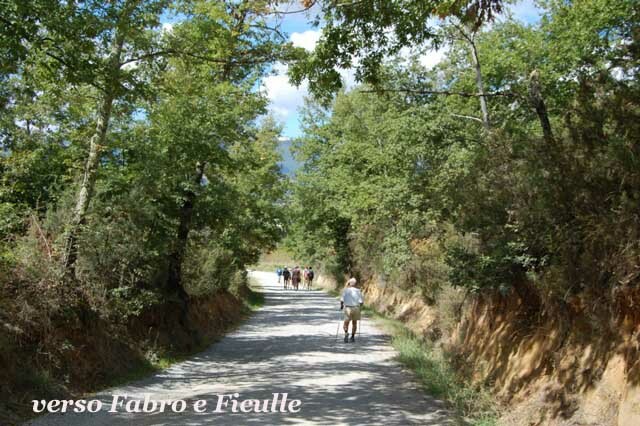 The road leading to Salci was built as late as 1834 (under the second last Duke Pio Camillo Bonelli) on the existing ancient path. The strategic position of the minute Duchy (situated between Città delle Pieve and Orvieto) was a buffer between two important states (The Grand Duchy of Tuscany and the State of the Church) This tiny Duchy as the object of bloody disputes since the Middle Ages. 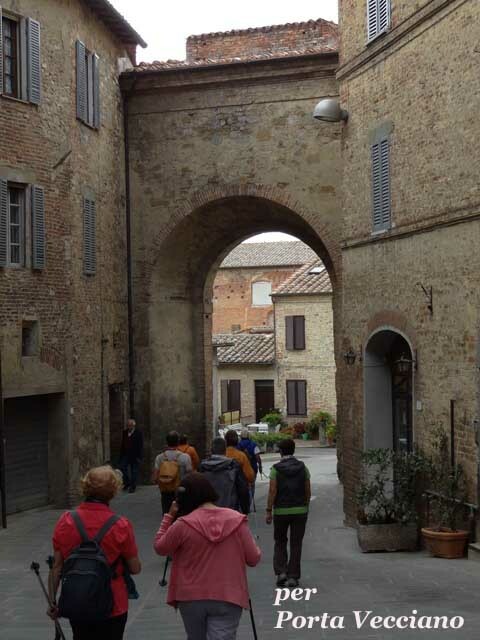 We enter Salci, through the Orvieto gate which is a square tower (with the Bonelli arms in stone). On the right is a building with crenellations where the night watch was once housed. 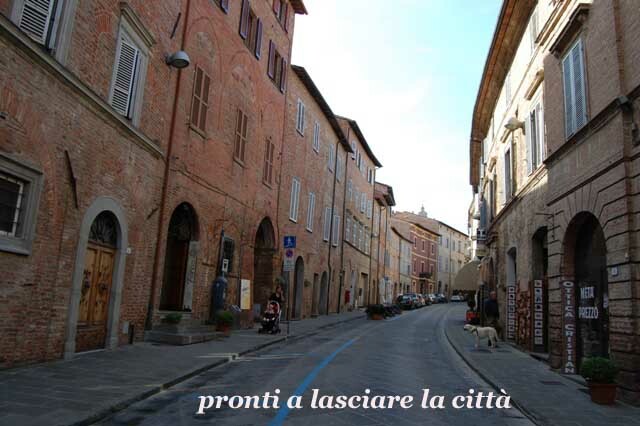 On the left a house, which housed the military garrison and the customs, a warehouses for agricultural supplies, The two inner courtyards are separated by the clock tower, ornate with an artistic Renaissance Loggia called “Loggia degli Spiriti” open corridor, which connected the Ducal Palace with the church of S. Leonardo. 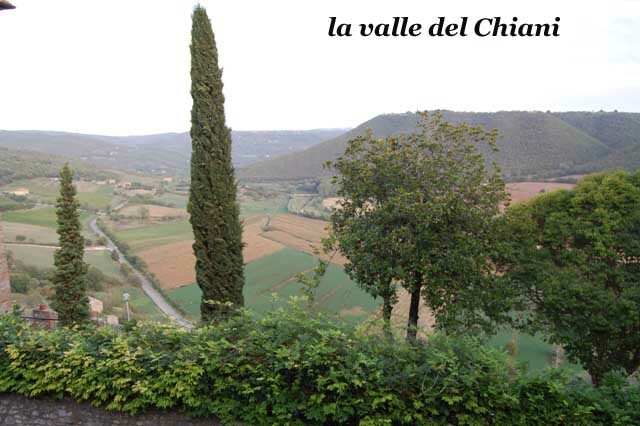 THE CHIANA VALLEY : Fabro and Monteleone d’Orvieto are the last two municipalities of the long and narrow valley of the Chiani River, which stretches from the Arezzo Province, crosses the Province of Siena ending up in the Umbrian provinces of Perugia and Terni. 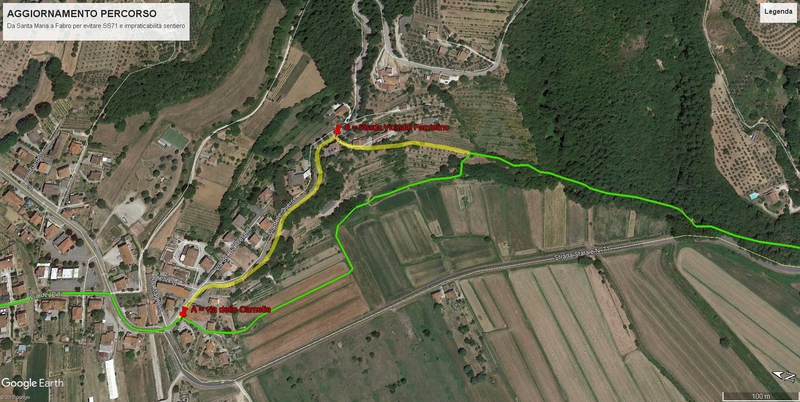 It is highly probable that the ancient Roman Via Cassia passed through Monteleone; today this has been replaced by the A1 Motorway, whereas our Via Romea has been replaced by the SS71 highway. Parrano can be seen on the hills on our left. 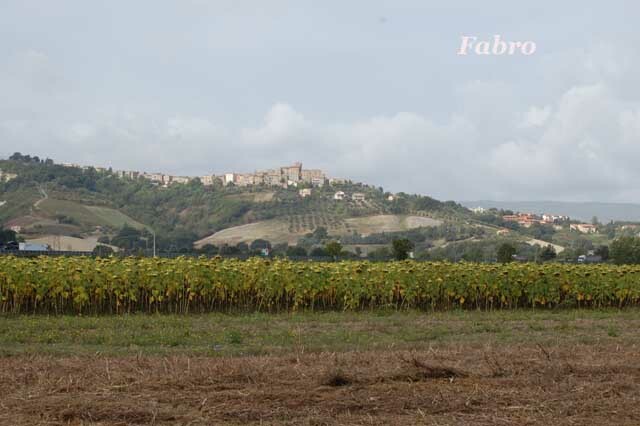 The lofty Castle keep towers above the town of Parrano, it was the core of what later became the town of today. It was built on this strategic position on Roman ruins and had the function of a lookout, as suggested by the two crenellated towers with a square plan, placed at the two extreme ends of the construction. 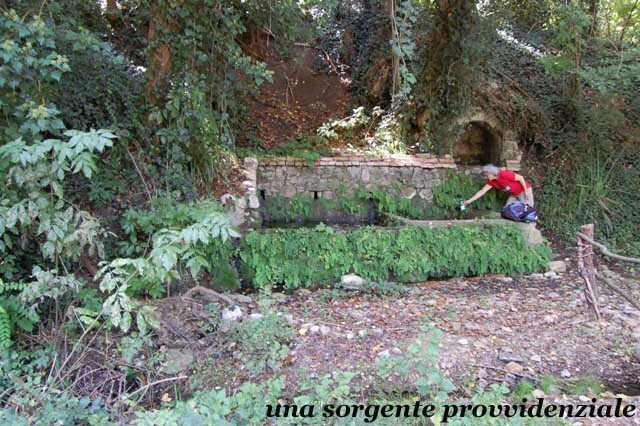 At the foot of the hill of Parrano there is a maze of karst caves, the Devil’s Den, where thermal water springs gush out into a pond at a temperature of about 28° Celsius. 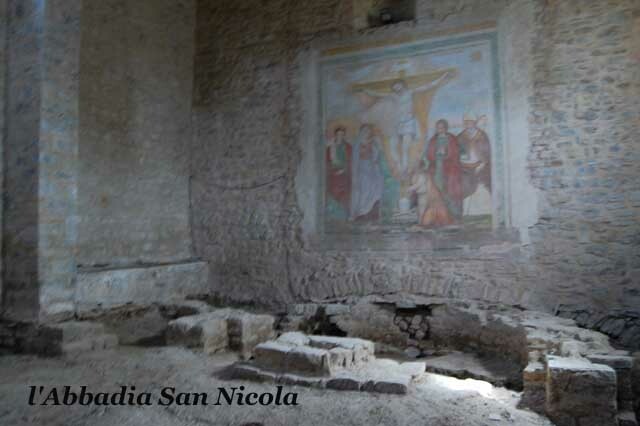 BADIA SAN NICOLA : The Abbey of S. Nicola, founded in 1007, was reorganized by St. Romualdo, here was, in fact, found a white marble capital with the emblem of the congregation of the Camaldoli monks. In this abbey, at the beginning of the 12th century, Magister Gratian wore the monk’s habit, he was the illustrious jurist who wrote the “Canonic Law” (Diritto Canonico), he was born in Ficulle and Dante places him in the fourth heaven, among the savant spirits, along with Albert the Great, Thomas Aquinas and Peter the Lombard. The Abbey was recently restored. 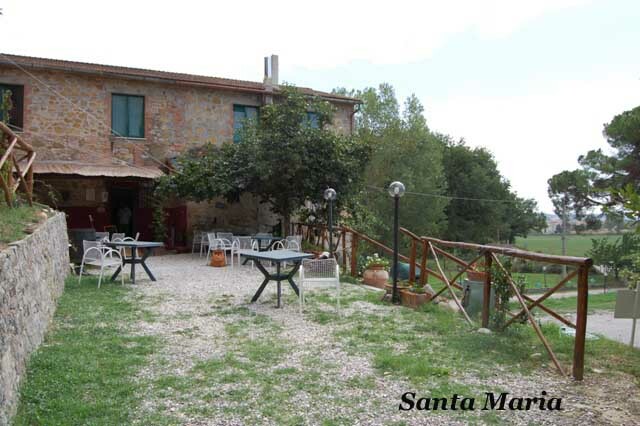 Leaving from the Orvieto Gate, we cross the ubiquitous SS71, and after a while we are on a dirt track, gong downhill to Ponticelli, soon we shall be in the valley of the Chiani River, along the State railway, As we descend we take the opportunity to visit the little church of Madonna degli Angeli. 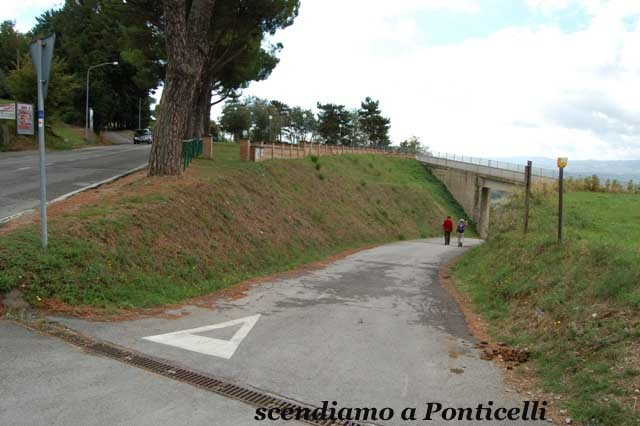 At the bottom of the slope we pass under two railway lines, and turn left to pass again under the high speed railway, proceeding along the reclamation canal, on a dirt road, all flat and easy for 1,5 km to arrive at a crossroad and a footbridge: going on the right we could take a deviation for SALCI (4 km), this is the abandoned village mentioned above, then carry on to Fabro. If instead we turn left and cross the bridge, we pass under the railway line tunnel, and follow the road along the woods and fields, up o the village of Santa Maria ( a fine refreshments place in the municipality of Monteleone di Orvieto, a fascinating village on a ridge on the left) then we walk through a parkland called “artistic park”, all the way up to Fabro Scalo: From here we can climb up to the Historical centre of Fabro. The castle is particularly interesting, today it is the town hall. 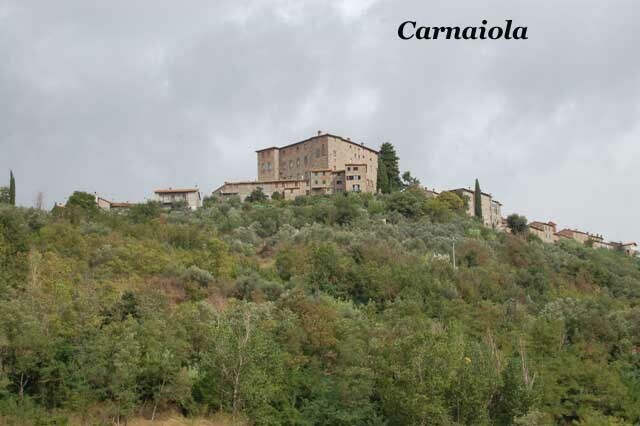 Turning right along the road we get to the motorway; whereas turning left we can go up to the village of Rocca di Carnaiola: a fascinating ancient compact village, the Palazzo of the Earls of Marsciano is very beautiful. 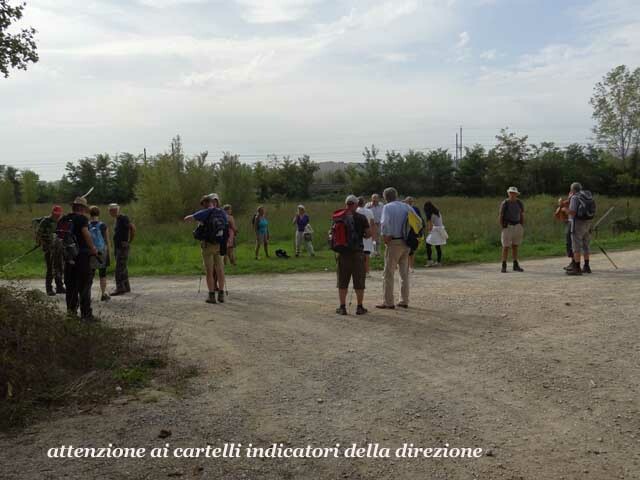 After visiting Fabro, we resume our walk from Fabro Scalo in Piazzale Carlo Levi. 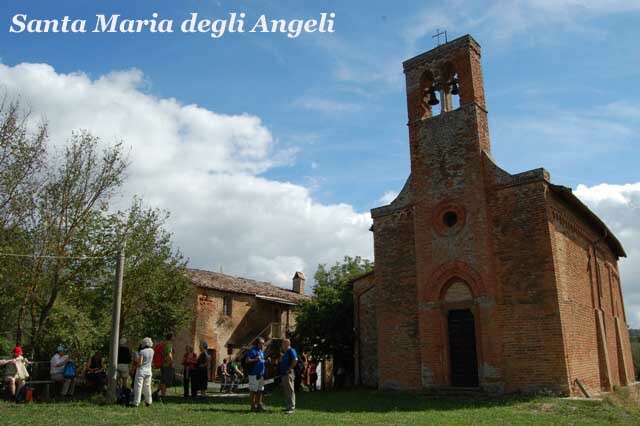 We take Via del Ponte, passing below the keep of Carnaiola and take the Provincia Highway to Parrano which we leave after 700 m; we turn right to go to the bridge on the Chiani where we have a choice of routes for reaching Ficulle: the shortest, but mostly with tarmac and following the direction of the SS71; the other longer (+4km) but historical and evocative which follows the river, and is unpaved, and mostly through forested land. If we take the first, we carry on straight after the bridge on the Chiani for 350 m, then we turn right and on for 1 km more and we shall be in the familiar SS71. 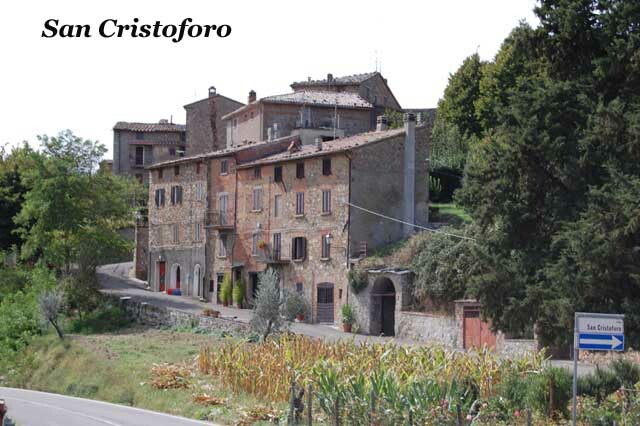 We cross it and take Via del Molino and after 1,5 km we find the crossroad with the railway underpass where we turn left and start the uphill road to Ficulle. 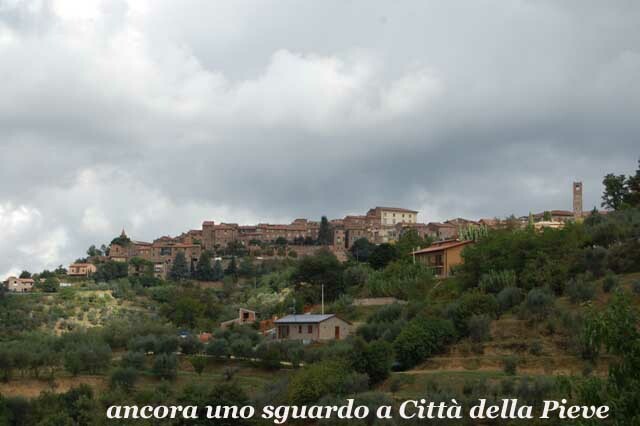 Arrived at the town upon entering again on the SS71 by the spots ground where we turn left and after 100 m we take to the left Piaggia di Cola di Rienzo, the Corso delle Rinascita, and we shall be in the Historical Centre of town. 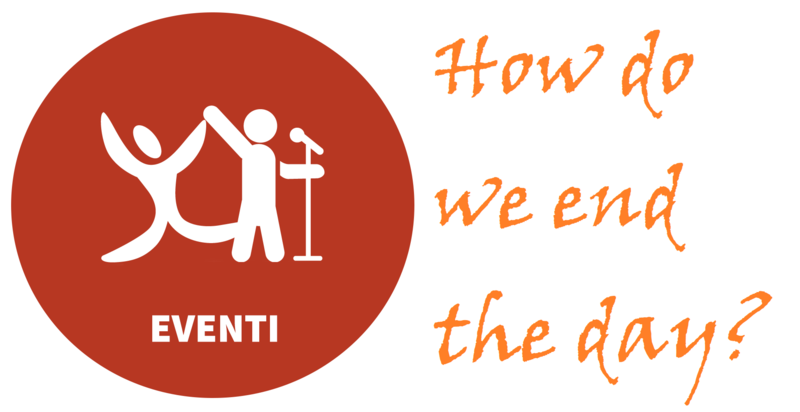 Alternatively, after the bridge on the Chiani we turn left and walk on the embankment of the river-canal for 1,4 km, then turn right at the level of the bridge and follow the dirt road for 1,5 km up o the crossroad with the road descending from the Provincial Highway SP52; here we turn left and straight on to three crossroads with private drives, we turn left to the crossroad with the road to Olevole, which itself leads to Ficulle: we follow the road signs for Badia San Nicola, continuing on the right at the first crossroad which will be 1,5 km away. A little further on, after a brief slope there is a fountain with good cool water. 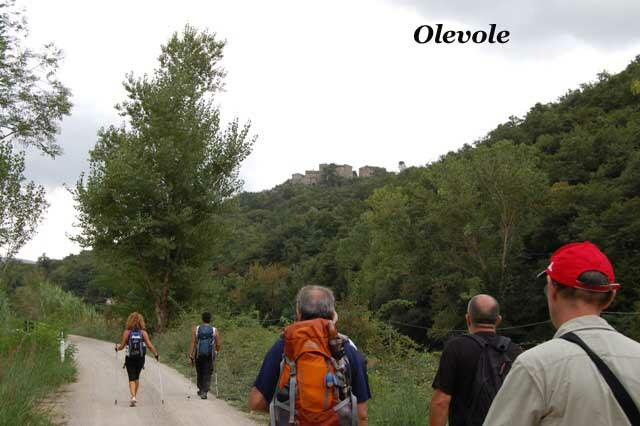 We resume the journey back on our steps for about 300 m and turn left; a beautiful climb begins for 1 km: first in the woods, then among the olive trees and we get to an asphalt road; we turn left and in 2 km we get to Ficulle after crossing the hamlets of San Cristoforo and Cappuccini, entering SS71, right in front of the previous route; we turn left and climb along Piola di Cola Rienzo and we arrive at the center.